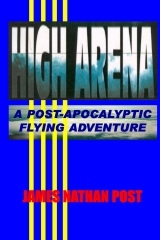 To order HIGH ARENA in paperback, click HERE. This story is a post-apocalyptic survivalist action adventure, set in the high Canadian Rockies, about a semi-nomadic family group of about forty free-traders who must move south for the winter with a storm at their backs, about 25 years after the "Great Fall" which reduced 21st Century civilization to a remnant. They encounter another family group under the command of an authoritarian patriarch, who have built a blockhouse to control the only pass, and who survive by exacting as much toll as possible. Though neither are "bad guys," their different survival forms force them to compete, and unlike the cliche geek-packs in some films of the genre, neither family can afford to waste warriors on a last-reel massacre. They have to find a better way. As bonus, a series of footnotes tell a second imbedded back story about the amazing airplanes which are featured in High Arena. To read a chapter from the book, click HERE. Copyright © 2011 by Postscript Publishing Company, Albuquerque NM 87108.